On the fifth day of Silverlight, the team delivered to me… text improvements. Today’s post is sort of a wrap up from yesterday’s Link text post. I thought it would be important because text quality is something that many people have asked for. Each version of Silverlight has addressed it, but SL5 does a great job polishing it out. The first area is simply text clarity and optimization. A lot of work went into making text look clearer and easier to read. This helps the folks who are creating magazine or book style applications. Readability is a big plus in these type of scenarios. The next new feature to look at is called character spacing. Another aspect of text in Silverlight that people have been wanting more control over is the actual text layout. The new CharacterSpacing property helps to address that need. This new property has been added to the Control, TextBlock, and TextElement classes. The CharacterSpacing property does just it says, adjusts the amount of spacing between each character. The default value is 0. The value is based on 1/1000 of the character width. This is beneficial because it scales based on font size, etc. That way you are not having to adjust on the fly if you have variable text sizes. It will accept positive and negative numbers to give you full control. Below is a sample of CharacterSpacing in action. Just to prove that the spacing is set to 1/1000, if you set the CharacterSpacing to –1000, as shown in the last example, the characters will stack directly on top of each other. Not that you will need to do this very often, but if you do need to you can. Next we move on to line spacing. 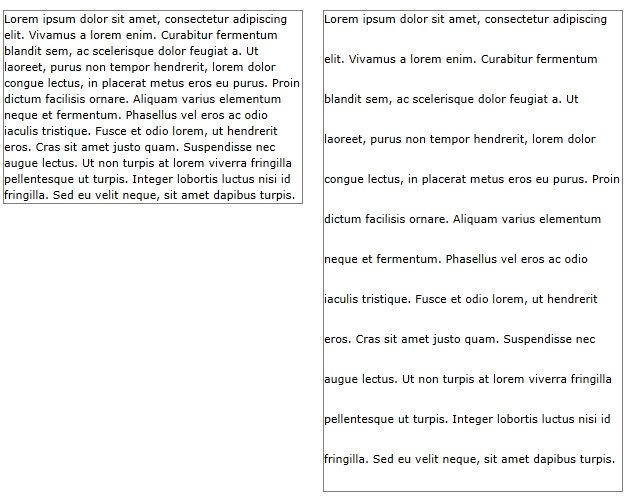 SL5 introduces a LineHeight property to the Block, TextBlock, TextBox, and RichTextBox controls. LineHeight is separate from the FontSize property. It does not change the overall size of the text, simply the space used to display it. In testing the LineHeight, it seems that it will not go below the default size of the text. So if your FontSize is set to 20 and you set the LineHeight to 5, the lines will not stack on top of each other. The default value is 0, which puts the LineHeight into an auto mode. Since this is the actual height of the line, a negative number will throw an error. Here is the LineHeight in action on a RichTextBlock. congue lectus, in placerat metus eros eu purus. id fringilla. Sed eu velit neque, sit amet dapibus turpis. As you can see, there are several fine tuning text improvements in SL5. Make sure you take advantage of them to help dial in your displays of your applications. Your users will appreciate it. More 12 Days of Silverlight is just around the corner, so I will see you then. Grat stuff Tony, very helpfull! Do you know something on the new simplified animation you can add to a control? I remember there was talk about that at the SL5 Firestarter.